You may not be aware of this (especially since I don’t like to brag) but in addition to being a master chef, culinary genius and jet-setting supermodel, I am also a very well-known and highly esteemed party planner. Yes, it’s true. In fact, I’ve been the brains behind many parties and receptions that most of the world is probably somewhat familiar with. You’ve heard of William and Kate, right? So, this past weekend was mi abuela’s birthday and mi mama decided she wanted to throw her a surprise party. Of course she immediately turned to me to take the reins in planning the whole fiesta, of which I was very happy to oblige– with a fee of course. Since she was family I only charged her two Costco-size bags of baby carrots instead of the regular ten. What can I say? I’m a softy when it comes to mi abuela. She gives good cuddles. 2) In a small bowl, whisk together milk, lemon juice, vanilla, agave and sugar. 3) In a large bowl, whisk together the flours, baking powder, baking soda and salt. 4) Pour wet ingredients into dry and mix until just combined. 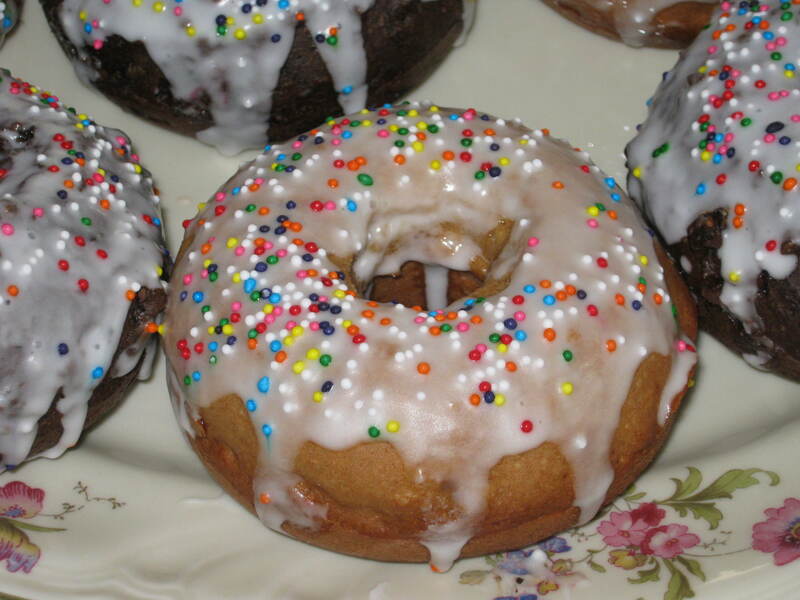 5) Pour into greased doughnut pan and bake 15 minutes or until a toothpick comes out clean. 6) Allow to cool completely before icing. 7) Mix icing ingredients in a small bowl using a hand-held mixer on low until creamy. Spread on cooled doughnuts and top with sprinkles. 8) Serve to all your tea party guests and watch them become amazed at how delicious a low-fat, non-fried cake doughnut can really taste. 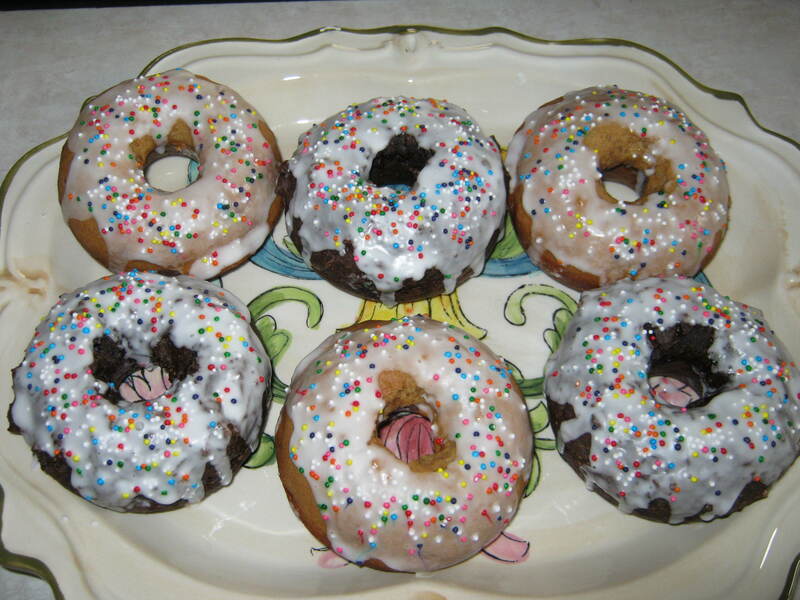 *Side note: If you want to make chocolate doughnuts like the other ones shown in the picture, add in 1/4 cup cocoa with the dry ingredients and 1/2 cup mini chocolate chips with the wet. Muy chocolatey! Well I must be going now. I managed to sneak a couple mouthfuls of food from the party guests’ plates when they weren’t looking and now I’m feeling a little bit flabby. 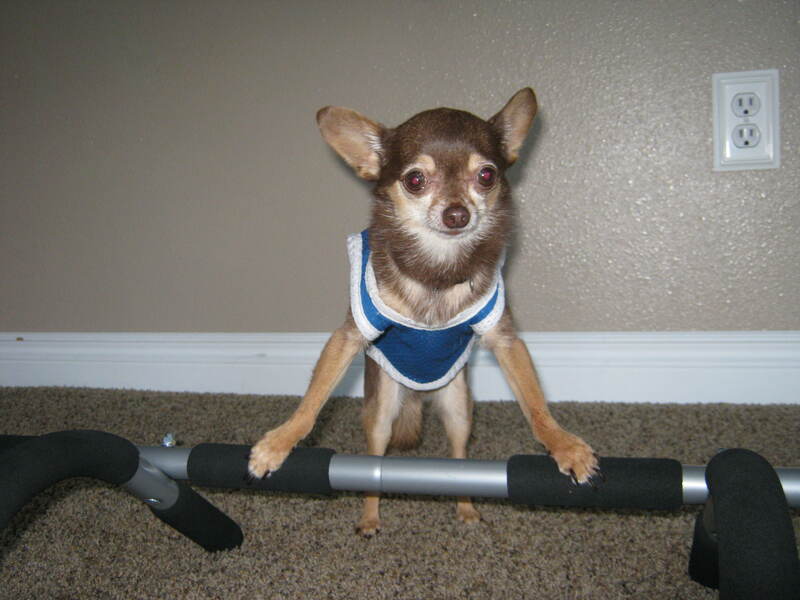 To the gym I must go.